The Marian Library was founded in 1943 in part to fill the need for a center dedicated to scholarship on the Virgin Mary in the United States, but also to be a resource for the University of Dayton community and a living symbol of the University’s Marianist tradition. While we’re still at the start of a new semester, we want to remind the UD community of the wealth of Marian Library resources available to them online, and introduce new students to our incredible collections! Within the last 25 years, major undertakings like a 7-year cataloging project and the creation of the encyclopedic website All About Mary have helped increase accessibility to our collections. The cataloging project made Marian Library holdings available through the University’s library catalog and the international Online Computer Library Center database, WorldCat. 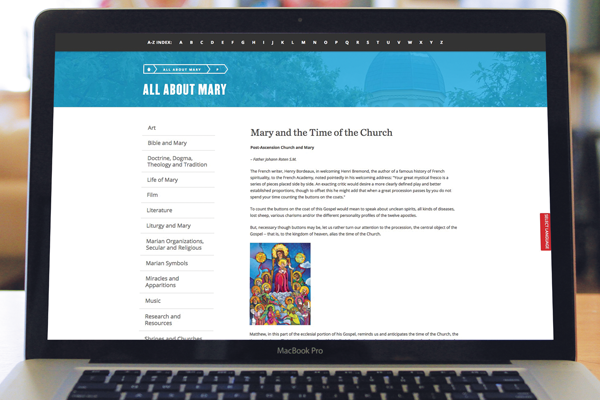 All About Mary gives visitors access to more than 1,000 pages of information related to the Virgin Mary. Digitization of collections remains a priority. Recent efforts have included putting parts of the John Stokes and Mary’s Gardens Collection and novenas from the pamphlet collection on eCommons, which also holds Marian Library publications, historical photographs, holy cards and much more. Students and professors should also explore the Marian Library’s page on teaching with special collections, where they’ll find lists of items from Marian Library collections in different subject areas and ideas of how to use them to complement course work. Make sure to connect with us on social media to see objects from our collections highlighted and keep up to date with events and exhibits happening in the Marian Library. You can follow us on Twitter, Instagram, Facebook, Tumblr and Pinterest @MarianLibraryUD. Or contact us with your reference questions at mlimri@udayton.edu. Finally, don’t forget to check out the Marian Library’s 75th anniversary exhibit, #MarianLibrary75, showcasing the history of the Marian Library and highlights from our collections. Visit the exhibit in the 1st and 7th floor galleries at Roesch Library. See more details here. Read recent items about Mary in both Catholic and secular news. Also, see International Marian Research Institute news and updates. On September 12, we celebrate the Name of Mary, which is the theme of this week's chosen content.